The University of Kansas Medical Center is pleased to announce its third annual sustainability week event. This event will take place the week of April 22rd on the main campus, 3901 Rainbow Blvd, Kansas City, KS 66101. This year's sustainability week will focus on promoting sustainability initiatives on campus, launching the Botanic Gardens, and supporting our community. Take part in activities and interactive displays, visit with vendors working on sustainability around Kansas City, nominate a sustainability champion, pick up a Cupanion sticker and learn how to Fill it Forward, recycle glass and printer cartridges, enjoy free snacks, play courtyard games, and win raffle prizes! The Spring Recycled Tulip Bulb Sale will be part of this year's fair. As the beautiful tulips across campus lose their blooms, our landscape team removes them for recycling to employees, students, visitors and neighbors in our community. This year's sale will benefit the KU Medical Center Botanic Gardens. Bulbs are 10 for $1, sold in sets of 10. There will be a 10 bulb minimum purchase and 100 bulb max. Remember to bring a bag or box to transport your bulbs home. If the bulbs are not finished blooming by April 22nd a new date and location for the sale will be announced. Bring your mug to the Murphy Lobby on Tuesday from 8 am - 9 am for FREE coffee, tea, and hot chocolate and great conversation! 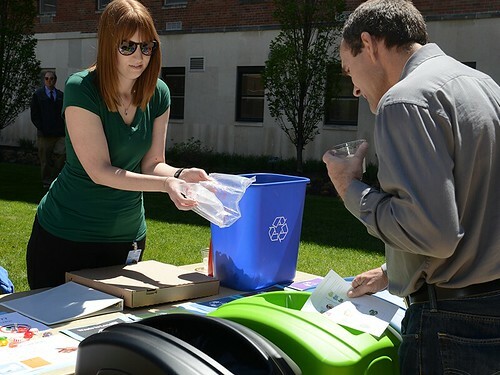 Learn more about sustainability efforts on KUMC campus like recycling, solar panels, and botanic gardens. Bring your favorite reusable mug to take a "mug shot" with and enter to win the best mug contest! Join the Office of Student Life from 12-1 p.m. in the Health Education Building courtyard to practice tips and tricks for creating a healthy, well-rounded lifestyle. Stop by and get active with yoga, grab some healthy snacks, and tackle a 25-foot rock wall. Each spring, an individual and a group are honored with this award during a special ceremony highlighting their work. The ceremony includes a keynote address focusing on a timely topic, crucial to advancing diversity and inclusion in our community. Reception to follow. You are invited to enjoy the return of spring weather at the Grand Re-Opening of the Murphy Courtyard! Bring a picnic blanket to enjoy some yard games and free snacks. Our landscaping team will host their annual Arbor Day tree planting in the Courtyard and will give away tree saplings. 5:30 p.m. - approx. 8:00 p.m.
Volunteer with KU Medical Center to be a part of our "green team" at a Kansas City Royals game. Volunteers will help fans learn about sustainability, collect recyclable items and represent the medical center in our community. As a volunteer, you will work pre-game and through the third inning, after which you can stay and watch the rest of the game for FREE! Free parking for volunteers will be available. Event Information available here. This event is open to all KUMC employees, students, and their family members 16 and older. Sign up by emailing recycling@kumc.edu. You are invited to the third annual Garden Party outside Dykes Library. Dykes Library and the Office of International Programs have partnered with the KU Medical Center landscaping department to offer a bounty of fruits, herbs and vegetables from the edible garden. See what the summer has in store and hear all about the Botanic Gardens. 11 a.m. -1 :30 p.m. Enjoy free food, lawn games and giveaways. Join the "Cupanion - #fillitforward" movement and learn how you can win free drinks at Paleterias Tropicana, win free classes at Kirmayer Fitness Center, and support Water.Org in bringing safe water and sanitation to the world through access to small affordable loans. In addition, stop by to support your nominee for the Sustainability Award when leadership presents the annual sustainability awards at noon. University ID badge required. All sustainability champion nominations must be received by Monday April 29th, 2019. * All members of the KU Medical Center community, including faculty, staff, students and the Kansas City, Kansas community at large are welcome to attend the Sustainability Fair on April 22 and the Murphy Courtyard Grand Re-Opening on April 26th. Do you have questions about sustainability at the University of Kansas Medical Center? If so please contact Margaret Okunoren. Sustainability Newsletter Jan. 2019 - Contains updates on recycling, Cupanion, and green teams!